80 had her first sweetcorn on Sunday. We attended a heavy metal pool party that featured lots of great food. 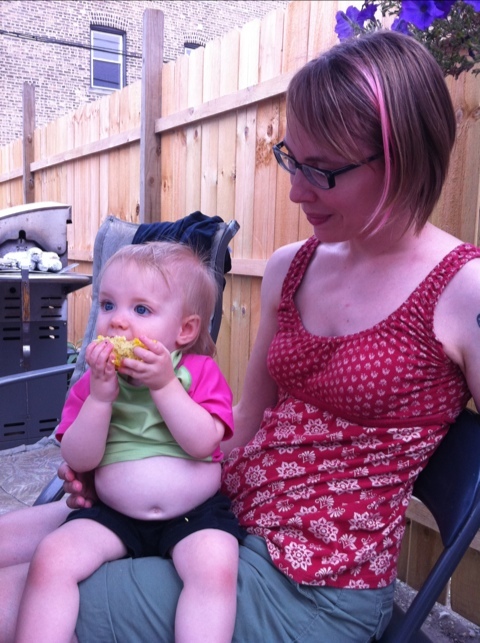 The corn was buttered and grilled, thus making it the best first sweetcorn a baby could have. It’s a great toddler food, since you really only need the front teeth to eat it, and the cob can be gnawed on to no I’ll effect. She also liked the spicy garbanzo bean salad, the pool, and the metal music.